This is the moment a stranded dolphin finally swam free after a boat crew battled for four hours to rescue it from mud. The dolphin was stuck on its side in the Everglades National Park, Florida, when it was spotted by a charter fishing crew last month. Chris Jones filmed the four-hour efforts of the rescuers as they dug in the mud to help the critter escape. 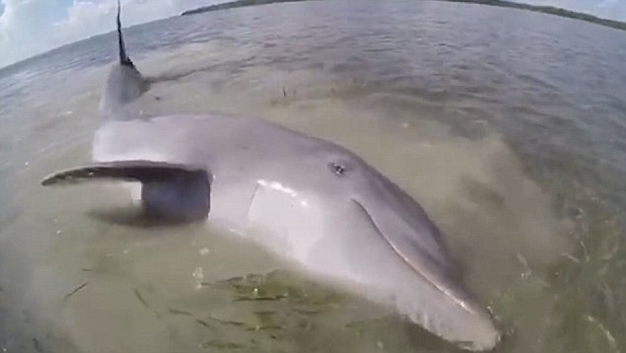 The video began as the dolphin splashed on its side in shallow water in a desperate attempt to free itself from the mud. But the creature had no luck alone, and quickly stilled when the small boat approached. Members of the boat's crew poured buckets of water over the stranded animal in an effort to keep it alive as they attempted to free it. Rescuers then wrapped a blue plastic sheet underneath the dolphin and carried it deeper into the water. The crew were seen cheering as the dolphin finally swam away following the lengthy rescue mission. Mr Jones said: 'My charter fishing company has been around for 13 years. This type of dolphin stranding is very rare. Responses to "Heart warming moment dolphin stuck in mud is rescued "